Show your support for your community members, friends and family battling cancer at the 14th Annual Sherry’s Run, which will be Sept. 9 on West Main Street in Lebanon. 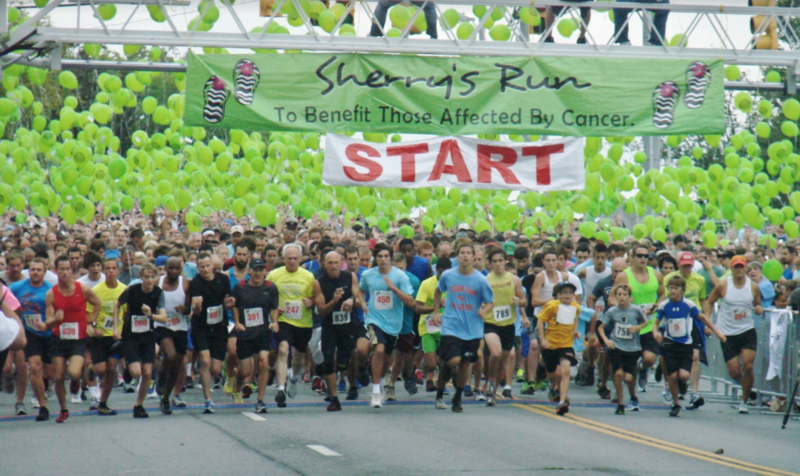 Sherry’s Run raises money to help cancer patients throughout the community. The event kicks off Saturday at 5:30 a.m. with a time for prayer, registration opens at 6:30 a.m. and the shotgun start is at 8 a.m. Online registration is open until tonight (Sept. 8) at 7 p.m. The organization is named after Sharon “Sherry” Patterson Whitaker, who lost her battle with colon cancer in 2004. Her friends and family wanted to fight this disease and make a difference for others with color cancer after losing Sherry. That desire led them to hold a 5K/walk that would support cancer research, which would become the first Sherry’s Run. There were a few hundred people at the first 5K/walk in 2004: Now, there are close to 4,000 participants and volunteers involved with the run. The uplifting day also includes live music, a survivor tent and other activities for the whole family. “It’s not about what cancer has done but about how we’re overcoming and providing hope,” says Van Dyke, who started working with the group in 2014. Both individuals and teams can participate in Sherry’s Run. “It’s a fun, pressure-free event,” Van Dyke says. This event is for anyone impacted by cancer. They also set up a tent at the event for survivors where they get to experience an outpouring of love and support. 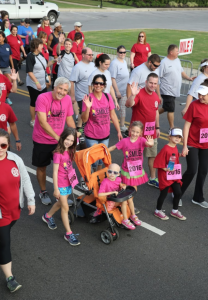 This year’s run is in memorial of Charles Tomlinson and Mackey Bentley, and it is in honor or Cindy Thorne and Denise Moore, who is a member of the Wilson Living Magazine team. Moore was a good friend of Sherry’s and was instrumental in getting support and donations for Sherry’s Run through the years, says Tamara Lampsa, who has been friends with Moore for about 14 years and is Sherry’s Run co-chair. Lampsa put together Team Mimi so Moore’s friends and family can show their support for her during the event. She’s expecting hundreds to join the team and honor their good friend. There will be several teams at the 5K/walk cheering on their friends and family, but providing that supportive environment isn’t confined to the annual event. While the group originally was focused on raising money for research, they saw a bigger need after receiving requests from local people battling cancer who needed a little extra help. So, Sherry’s Run became an organization and developed a patient assistance program. 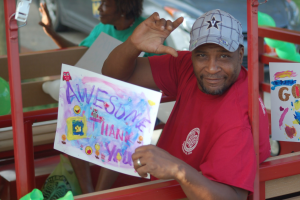 They’ve seen helped countless community members with cancer ever since. “We still believe in preventing cancer, but what about the people who already have it and are struggling to take care of their families?” Van Dyke asks. The majority of the people they help are referred to Sherry’s Run, and they supported 185 patients last year. They provide financial support for medical, lighting, grocery, gas and treatment costs — in addition to meeting their counseling needs. They also receive support from the Macon County Day of Hope and a Mardi Gras fundraising event at the Capitol. Van Dyke encourages people who know someone with a cancer diagnosis to refer them to the organization and also support the group year-round. For more information about Sherry’s Run, follow them on Facebook and Twitter, and visit Sherrysrun.org.